Around the country, people are beginning to emerge, mole-like and blinking, into the sunshine, having finally made parole after being imprisoned by a binge-watching session of Orange Is The New Black. Many of these poor wretches, drained from watching the recently released second season of Netflix’s popular prison drama, will be close to starvation, having sustained their bodies on nothing but couch lint, dropped potato chips, and whatever food they can summon without leaving their sofa-cells. And with the Orange Is The New Black cookbook still months from release, many of these poor, institutionalized souls will be left to fend for themselves for sustenance. But those who live in New York are in luck. 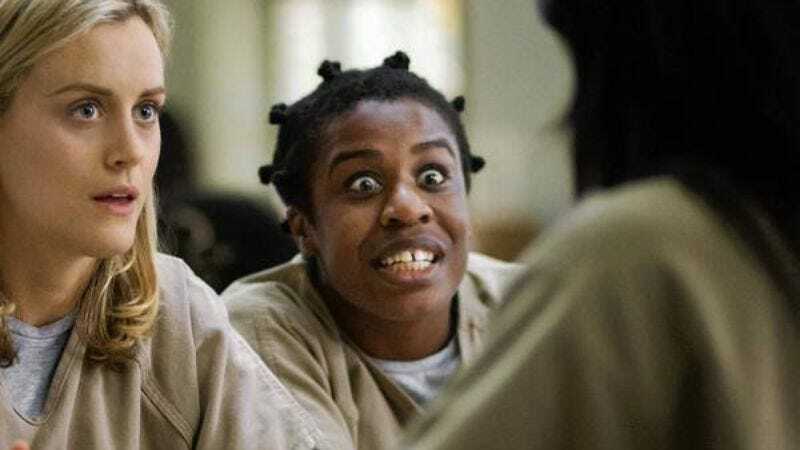 As reported in Variety, Netflix has created “Crazy Pyes,” a food truck named after Uzo Aduba’s popular character, Suzanne “Crazy Eyes” Warren. The cart will hand out free fruit-flavored pies and chocolate-vanilla swirl ice cream, celebrating milestones in the character’s sometimes sweet, sometimes frightening, and often funny campaign to make protagonist Piper Chapman her prison wife. New Yorkers can find the truck along the following schedule. As for everyone else, Netflix has announced it’s also planning to bring the truck to other, yet-to-be-announced cities throughout June. Saturday, June 14: 2-6 p.m.: Williamsburg, Brooklyn, at North 7th St.
No word yet on whether the cart will also serve lemonade, in honor of one of Crazy Eyes’ other acts of courtship.